Hadrian (reigned 117-138 C.E. ), once a tribune (staff officer) in three different legions of the Roman army and commander of a legion in one of Trajan’s wars, was often shown in military uniform. He was clearly keen to project the image of an ever-ready soldier, but other conclusions have been drawn from his surviving statues. When Hadrian inherited the Roman Empire, his predecessor, Trajan’s military campaigns had over-stretched it. Rebellions against Roman rule raged in several provinces and the empire was in serious danger. He ruthlessly put down rebellions and strengthened his borders. He built defensive barriers in Germany and Northern Africa. Rome’s first emperor, Augustus (reigned 27 B.C.E.– 14 C.E. ), had also suffered severe military setbacks, and took the decision to stop expanding the empire. In Hadrian’s early reign Augustus was an important role model. He had a portrait of him on his signet ring and kept a small bronze bust of him among the images of the household gods in his bedroom. Like Augustus before him, Hadrian began to fix the limits of the territory that Rome could control. He withdrew his army from Mesopotamia, modern-day Iraq, where a serious insurgency had broken out, and abandoned the newly conquered provinces of Armenia and Assyria, as well as other parts of the empire. Hadrian is also famous as the emperor who built the eighty-mile-long wall across Britain, from the Solway Firth to the River Tyne at Wallsend: “to separate the barbarians from the Romans” in the words of his biographer. 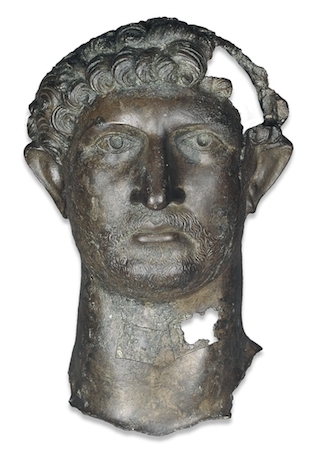 This head comes from a statue of Hadrian that probably stood in Roman London in a public space such as a forum. It would have been one and a quarter times life-size. This statue may have been put up to commemorate Hadrian’s visit to Britain in 122 C.E. ; Hadrian travelled very extensively throughout the Empire, and imperial visits generally gave rise to program of rebuilding and beautification of cities. There are many known marble statues of him, but this example made in bronze is a rare survival. Born in Rome but of Spanish descent, Hadrian was adopted by the emperor Trajan as his successor. Having served with distinction on the Danube and as governor of Syria, Hadrian never lost his fascination with the empire and its frontiers. Hadrian openly displayed his love of Greek culture. Some of the senate scornfully referred to him as Graeculus (“the Greekling”). Beards had been a marker of Greek identity since classical times, whereas a clean-shaven look was considered more Roman. However, in the decades before Hadrian became emperor, beards had come to be worn by wealthy young Romans and seem to have been particularly prevalent in the military. Furthermore, one literary source, the Historia Augusta, claims that Hadrian wore a beard to hide blemishes on his face. Hadrian fell seriously ill, perhaps with a form of dropsy (swelling caused by excess fluid), and retired to the seaside resort of Baiae on the bay of Naples, where he died in 138 C.E. 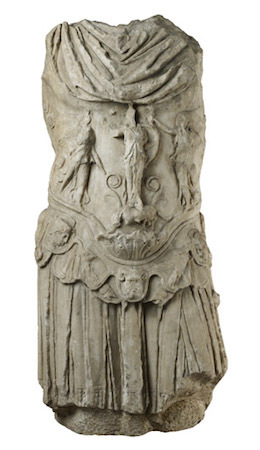 Torso of a statue of the emperor Hadrian wearing a cuirass, c. 130-141 C.E., 137 cm high, from Cyrene, northern Africa © Trustees of the British Museum. In this statue we see Hadrian presented as the commander-in-chief. We know from ancient literary sources that Hadrian was particularly keen to project a strong military image. The cult of the Emperor combined religious and political elements and was a vital factor in Roman military and civil administration. Deceased rulers were often deified, and though the living Emperor, who was the state’s chief priest, was not himself worshipped as a god, his “numen,” the spirit of his power and authority, was. The image of the ruler and information about his achievements was spread primarily through coinage. In addition, statues and busts, in stone and bronze and occasionally even precious metal, were placed in a variety of official and public settings. They varied in size: colossal, life-size and smaller. Such images symbolized the power of the state and the essential unity of the Empire. As well as the political importance of representations of the Emperor, his physical appearance and that of his consort and family were familiar to people throughout the Empire. This influenced fashion and such representations can assist the modern archaeologist and art-historian. For example, beards became fashionable after the accession of Hadrian, and the hairstyles of Empresses and other Imperial women may be seen in private portraiture and decorative art, even in remote provinces such as Britain. Cite this page as: The British Museum, "Bronze head from a statue of the Emperor Hadrian," in Smarthistory, February 28, 2017, accessed April 21, 2019, https://smarthistory.org/bronze-head-from-a-statue-of-the-emperor-hadrian/.